Cork's John McHenry closed with a super 68 but ended up coming up short in his bid for a European Senior Tour card. The former Walker Cup and European Tour player left a six-foot birdie chance short at his final hole and had to settle for 15th place on three over as the top six earned full cards and the next eight got conditional cards for the 2014 season. According to the European Senior Tour, McHenry will have conditional status for "a definitive period" but knows he will be lucky to get more than a couple of starts and he has no intention of hanging on the other end of a phone waiting to get into events at the last minute. "I was playing to give myself some options and haven't being playing a whole lot of golf for the last number of years," said the former Director Golf at The K Club. "I said I'd give it a go and I've put in a bit of work since December but a bad nine holes yesterday really cost me." Tied for 14th at halfway, his card bid suffered a major blow when he came home in 43 in a third round 76 to slip to 32nd place. He pulled out all the stops in the final round at Pestana Golf Resort’s Pinta Course in Portugal and was two under par for his round with seven holes to play but could only pick up one more shot. "It's disappointing but that is the way it is," said McHenry. "I started on the back nine and got two birdies on the par fives in the first three holes. "I had some great chances that I didn't convert, birdied the first and then made a poor mistake on the second hole, backed ball off the green and didn't get up and down and made a bogey six. "I was just chasing all the way around and had three chances on the last three greens but made just one of them, which was a pity. Most of the damage was done yesterday, unfortunately. "I might get a few starts but really I was coming here to try and get a top six and full status and to be perfectly honest with you, I am not going to be waiting around for starts. "It was nice to know that I am still competitive but there is no doubt that a few technical issues became obvious and they held me back. "I had trouble with my wedges — coming out of my shots and missing to the right — and that was very frustrating because it would be a strength of my game and having done the hard work to put himself in position to score from 80 to 100 yards, I couldn't hit my wedges close enough to the hole. "I may get one or two starts but I am not going to wait for one or two starts - I have to get on with other things." Another Corkman, Castlemartyr based amateur John O'Brien, finished tied for 48th after a 76 that was marred by a quadruple bogey nine at the 16th, his seventh hole. Andrew Murray stormed to a three shot win over compatriot Steve Cipa as a one under 70 gave him his first tournament victory since the 1989 Panasonic European Open. The two Englishmen were joined by four others, including three Americans, in claiming unconditional cards for the coming campaign. One of them, Jerry Smith, carded the round of the day - a five under par 66 - to seal the third card on offer, while Barry Conser (72) and Gary Rusnak (69) finished in tied fourth alongside Italian Marco Bianco (69). Jean Pierre Sallat, a former professional footballer in France’s top league, completed an impressive recovery from a seven over par second round of 78 by carding a second successive 69 to earn one of the eight conditional cards on offer. He was joined by Robert Arnott of Scotland, Englishmen Mark Belsham, John Gould Wraith Grant , Gary Marks and George Ryall as well as Australia’s Glenn Joyner, who chipped in for a crucial eagle at the par four 17th hole to clinch his spot. McHenry and England’s Tony Lawrence will have conditional cards for a definitive period, with two of the successful players yet to turn 50, having finished in 15th and 16th place respectively. Headfort’s Brendan McGovern fired one of the rounds of the day to keep his European Senior Tour card hopes alive at the Qualifying School Final Stage in Portugal. Austrian Gordon Manson takes a two stroke lead into the final round of Senior Tour Qualifying School. Pic ©Getty Images The European Club’s Pat Errity needs a low final round to secure his card for the 2011 European Senior Tour. The top six players get full playing rights with the next eight earning alternate status for next year’s over 50s circuit. And amateur ace Errity, who turns 50 in March next year, is just two shots outside the magic number in a share of 11th place after a third round 74. 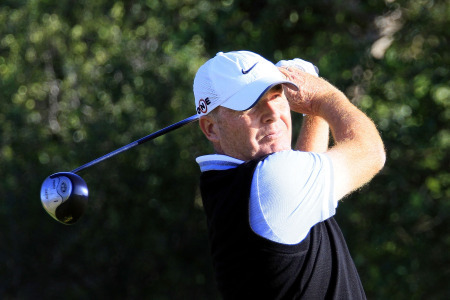 Peter O’Hagan is still in with a chance of winning his European Senior Tour cardNewry’s Peter O’Hagan fired five birdies in a two under par 69 to keep his hopes of winning a European Senior Tour card alive on the second day of the Qualifying School Final in Portugal. Former European Tour professional John McHenry is three shots outside the magic number after the first round of the European Senior Tour’s Qualifying School Final Stage in Portugal.